Are you aware of the chemical aspects of the culinary world? I am not referring to the molecular gastronomy that is all is the rage, but rather the actual chemistry of cuisine. Chemistry is essential to the molecular style of gastronomic palaces, such as Spain’s El Bulli, WD-50 in NYC, or Alinea in Chicago, but we can all benefit from learning which foods (and wines, too) pair well together, based on their chemical composition. I was listening to a radio program on the CBC (Canadian Broadcasting Corporation, for you non-Canucks out there), featuring a sommelier from Québec, François Chartier. M. Chartier has written a book called, Papilles et Molécules, which has come out now in English, Tastebuds and Molecules (http://www.francoischartier.ca/english). The show was on molecular structures, which makes certain foods natural companions, based on their chemical composition. 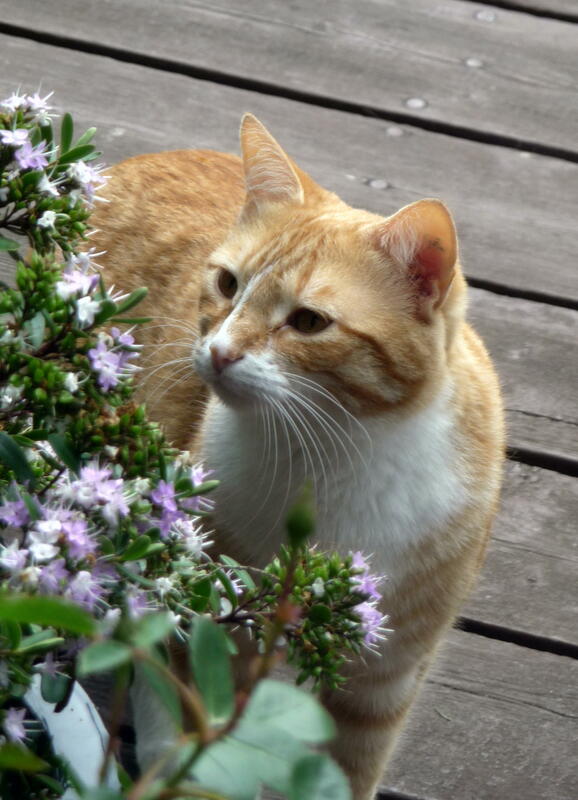 As ginger is a must for this post, Jinja must check out a hebe in bloom on the deck. One example M. Chartier gave was the pair of soy sauce and maple syrup. As a Canadian, I hope you know that I mean only the pure stuff, and never would dare to consider the gloppy kind in a plastic squeeze bottle, such as the corn-syrup-artificially-flavoured-Mrs.-You-Probably-Know-Who brand. Apparently, maple and soy sauce are chemical cosmic twins! Who knew? 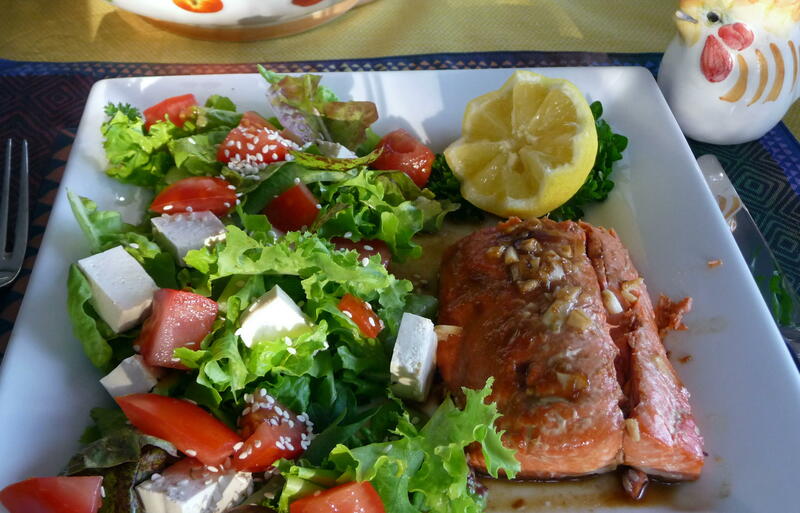 The molecular twinning, of course, works for food with wine (mint and sauvignon blanc, for instance) as much as it does for expected food pairings (lamb and thyme) in addition to more unusual combinations (raspberries are chemically counterparts of nori, or seaweed, which surprised me). It is a fascinating chemical explanation why certain foods do go well together naturally, even those from places of origin, e.g., maple syrup tends to be from areas which did not traditionally grow soy beans and make soy sauce. So the locavore argument does not get much of boost from this dish.